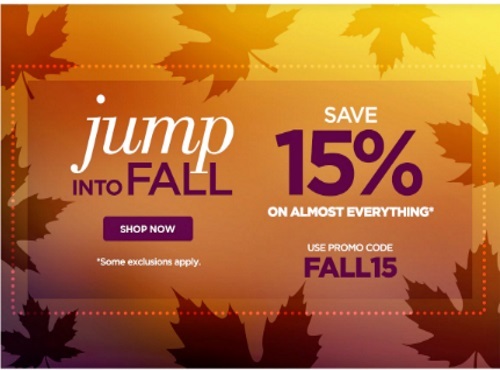 Jump Into Fall at The Shopping Channel and save 15% off almost everything with the promo code below! Enter the promo code FALL15 at checkout to get the discount. Offer is valid until September 9 at 9:59pm ET. Promo code cannot be redeemed on KitchenAid, Vitamix, Dyson, Pink Tartan or Ron White merchandise, Coins & Banknotes, Electronics, Electronic Accessories, Gift Cards, Auto Delivery items, our Today's Showstopper offer, Encore Today's Showstopper offer or Exclusive For You Today's Showstopper Presale offer, or redeemed for cash, or used towards payment of the TSC Credit Card.